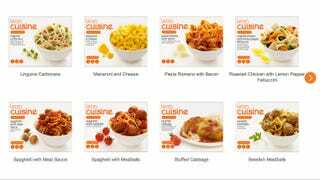 Nestle is recalling more than 500,000 Lean Cuisine microwaveable dishes because some consumers have reported finding fragments of broken glass in their sealed meals. The meals in question are the Lean Cuisine Culinary Collection Mushroom Mezzaluna Ravioli that were distributed to grocery stores in November of 2012, bearing production codes of 2311587812 and 2312587812. In a press release announcing this voluntary recall, Nestle declared that only three consumers have reported finding glass fragments in their meals, and the company also believes that all of the microwave dishes in question have already been sold by now. However, the expiration date on these specific meals is December 2013, so there is a possibility that many of them are still in the home freezers of many consumers. I have to say, I think Lean Cuisine is missing out on a major marketing and public health opportunity here. If you think about it, broken glass is a fantastic weight-loss supplement! (Just try absorbing calories when your stomach and esophagus are riddled with holes!). One might even call it a superfood. So I say rebrand Mushroom Mezzaluna Ravioli as Mushroom Mezzaluna Lacerationitoni! It's Italiano! Abbondanza! To that end, I've come up with some suggestions for how Lean Cuisine could update their other popular frozen dinners to get even more aggressive about weight loss. After all, WE'RE IN THE MIDST OF AN EPIDEMIC. Feel free to add your own in the comments!